Despite the snow, the show will go on! The National Cherry Blossom Festival started Saturday after organizers pushed back the opening date of the Tidal Basin Welcome Area from Wednesday because of the snowstorm. The storm left many of the famous blooms strikingly coated in ice and about half of the blossoms survived the cold snap, according to the National Park Service. But NPS expects there will still be "a brilliant display of the white and pink blooms." Thursday, March 16: Pink Tie Party at the Ronald Reagan Building -- This bash raises money to benefit the National Cherry Blossom Festival. Enjoy bites from top local restaurants, an open bar, and activities such as a 360-degree video booth. Tickets are $90-$300. Saturday, March 25: Opening Ceremony at the Warner Theatre -- Performers such as the EL Squad (featuring a "light dance") and May J (a multilingual J-pop artist) will welcome spring. Attendees must request tickets in advance. ticketing required. Tickets are free, but there is a $5 registration fee when they are claimed. Saturday, April 1: Blossom Kite Festivalon the Washington Monument grounds. Hope for a suitably breezy day for this fest of demos and competitions, as well as the Hot Tricks Showdown. You can bring your own kite, and kids can make theirs at an activity station (while supplies last). Admission is free; April 2 is set as a rain date if needed. 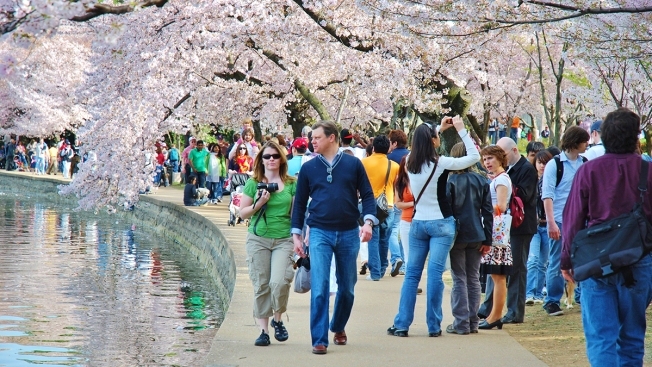 Saturday, April 8: National Cherry Blossom Festival Parade and Sakura Matsuri Japanese Street Festival. The parade and street fair are some of the Cherry Blossom Festival's most popular events. Watch as colorful floats and notable performers make their way down Constitution Avenue; then enjoy Japanese cuisine and live music at the street fair. Tickets for grandstand seating at the parade are $20, but general viewing areas are free, as is admission to the street fair. Saturday, April 15: Southwest Waterfront Fireworks Festival at the District Wharf. Enjoy a day on the waterfront with a beer garden, food trucks, live music -- and fireworks after dark! Admission is free.